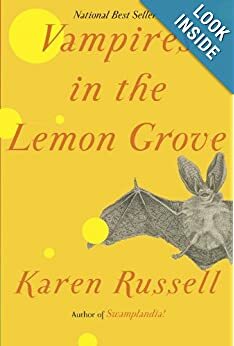 I was sprawled in the grass at the park with my boyfriend, reading Karen Russell’s short story collection, Vampires in the Lemon Grove, and laughing out loud. “What is it?” my boyfriend finally asked. Apparently his theoretical physics book wasn’t quite as amusing. I turned the page and continued reading. Things had begun to take a dark turn. “Oh no!” I moaned, pressing my hand to my heart. “Well…” I paused, knowing that whatever summary I gave wasn’t going to come out right. And that, as it turns out, describes most of the stories in Russell’s delightful new collection: funny, clever, sad, weird. And also really good. If you read Russell’s Pulitzer Prize nominated novel, Swamplandia!, or her first collection, St. Lucy’s Home for Girls Raised by Wolves, you know that Russell’s genre of choice is the modern fable. You know she excels at creating bizarre, slipstream worlds filled with eccentric characters in curious situations. You also might think (as I do) that she’s often better at creating these situations than she is at resolving them. To be honest, I skimmed the second half of Swamplandia! I felt terrible about it. The book had started out so good: rich, masterfully-written imagery, interesting characters, a fantastically bizarre situation. But then the book got stuck in a long and swampy middle that felt like a hunt though the muck for a way to end things. I was disappointed. I could feel in my bones that Russell’s writing was something special, and I desperately wanted to like it. “I bet her short stories are really good,” I remember thinking to myself. And they are. In fact, until I see a novel that changes my mind, I will assert that Russell is a short story writer, not a novelist. After all, fables are meant to be short, and fables are what she does best. The stories in Vampires are both amusing and heart-breaking. Beautiful and disturbing. Silly and philosophical. Let’s face it — anyone who can take me on an emotional roller coaster ride with a story about presidents trapped inside horse bodies has a gift. Russell is truly a creative storyteller. In “The Graveless Doll of Eric Mutis,” a group of boys finds a scarecrow in the park that has the same face as the epileptic boy they used to bully. In “Reeling for the Empire,” Japanese peasant girls are imprisoned in a silk factory where they slowly begin turning into giant silkworms. And in the poignant title story, two vampires try to quench their thirst for blood in a sunny Italian lemon grove. Throughout the collection, I was continuously amazed, not only at Russell’s imagination, but also at the scope and variety of the book. Unlike other collections where stories are often similar in setting or theme, Russell dips into different countries, different time periods, different cultures. She writes from the perspective of an eleven-year-old boy, a forty-five-year-old woman, an ancient vampire. She sprinkles her stories with facts from history and biology and linguistics. Her stories are often weird, but she knows that even in fantastical situations, real feelings and real truths can be explored. Unfortunately, Russell’s Swamplandia! problem rears its head (or shows it’s fangs?) in Vampires, too. She introduces us to awesomely eccentric characters in bizarre situations. She takes us on a series of dark turns, corkscrewing us down deep into the world she has created. But then, once we’re tightly in, she has trouble getting us out. She often opts for what I deem the “literary magazine cop-out approach,” in which the story ends, vaguely unresolved, with some sort of poignant thought or image. Luckily, unlike novels in which we have devoted great amounts of time and energy by the time we get to the end, vague resolutions aren’t as much of a turn-off when it comes to shorter pieces. All of the stories in Vampires have climaxes, but not all of them are resolved in a satisfying way. Still, even though I was a little disappointed by the endings of “Vampires in the Lemon Grove” and “The Barn at the End of Our Term,” it didn’t take away from the enjoyment I got while reading them. It didn’t negate my feeling that there was something truly special and meaningful about these stories. That they were greater than the sum of their weird parts. And several of the stories in Vampires have strong endings, such as “Reeling for the Empire” and “The Graveless Doll of Eric Mutis.” Endings that made me laugh, made me shiver, made me think. Besides, it’s not necessarily a bad thing to stay screwed in tight to a story. “Vampires in the Lemon Grove” affected me so deeply that I couldn’t stop thinking about it all day. I sat my boyfriend down that night and read the story out loud to him. I knew only giving him the summary wouldn’t do. He needed to hear the whole thing, from its marvelous beginning to its slightly flawed end.